Pedro de Alvarado arrived in Guatemala from the newly conquered Mexico in early 1524, commanding a mixed force of Spanish conquistadors and native allies, mostly from Tlaxcala and Cholula. Geographic features across Guatemala now bear Nahuatl placenames owing to the influence of these Mexican allies, who translated for the Spanish. 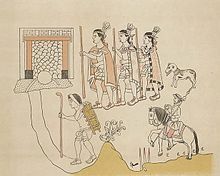 The Kaqchikel Maya initially allied themselves with the Spanish, but soon rebelled against excessive demands for tribute and did not finally surrender until 1530. 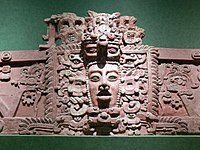 In the meantime the other major highland Maya kingdoms had each been defeated in turn by the Spanish and allied warriors from Mexico and already subjugated Maya kingdoms in Guatemala. The Itza Maya and other lowland groups in the Petén Basin were first contacted by Hernán Cortés in 1525, but remained independent and hostile to the encroaching Spanish until 1697, when a concerted Spanish assault led by Martín de Ursúa y Arizmendi finally defeated the last independent Maya kingdom. Dominican friar Bartolomé de las Casas arrived in the colony of Guatemala in 1537 and immediately campaigned to replace violent military conquest with peaceful missionary work. Las Casas offered to achieve the conquest of the Land of War through the preaching of the Catholic faith. It was the Dominicans who promoted the use of the name Verapaz instead of the Land of War. Because of the fact that the land had not been possible to conquer by military means, the governor of Guatemala, Alonso de Maldonado, agreed to sign a contract promising he would not establish any new encomiendas in the area should Las Casas' strategy succeed. Las Casas and a group of Dominican friars established themselves in Rabinal, Sacapulas and Cobán, and managed to convert several native chiefs using a strategy of teaching Christian songs to merchant Indian Christians who then ventured into the area. ^ a b c Municipalidad de San Cristóbal Acasaguastlán 2011. Chase, Arlen F. (April 1976). "Topoxte and Tayasal: Ethnohistory in Archaeology" (PDF). American Antiquity. Washington, D.C., USA: Society for American Archaeology. 41 (2): 154–167. doi: 10.2307/279166. ISSN 0002-7316. JSTOR 279166. OCLC 482285289. Archived from the original (PDF) on 2013-11-01. Retrieved 2012-12-02. Fowler, William R. Jr. (Winter 1985). "Ethnohistoric Sources on the Pipil-Nicarao of Central America: A Critical Analysis". Ethnohistory. Duke University Press. 32 (1): 37–62. doi: 10.2307/482092. ISSN 0014-1801. JSTOR 482092. OCLC 478130795. Fox, John W. (August 1981). "The Late Postclassic Eastern Frontier of Mesoamerica: Cultural Innovation Along the Periphery". Current Anthropology. The University of Chicago Press on behalf of Wenner-Gren Foundation for Anthropological Research. 22 (4): 321–346. doi: 10.1086/202685. ISSN 0011-3204. JSTOR 2742225. OCLC 4644864425. Hill, Robert M. II (1996). "Eastern Chajoma (Cakchiquel) Political Geography: Ethnohistorical and archaeological contributions to the study of a Late Postclassic highland Maya polity". Ancient Mesoamerica. New York, US: Cambridge University Press. 7: 63–87. doi: 10.1017/s0956536100001292. ISSN 0956-5361. OCLC 88113844. Letona Zuleta, José Vinicio; Carlos Camacho Nassar; Juan Antonio Fernández Gamarro (2003-01-01). "Las tierras comunales xincas de Guatemala". In Carlos Camacho Nassar (ed.). Tierra, identidad y conflicto en Guatemala (in Spanish). Guatemala: Facultad Latinoamericana de Ciencias Sociales (FLACSO); Misión de Verificación de las Naciones Unidas en Guatemala ( MINUGUA); Dependencia Presidencial de Asistencia Legal y Resolución de Conflictos sobre la Tierra (CONTIERRA). ISBN 978-99922-66-84-7. OCLC 54679387. MINEDUC (2001). Eleuterio Cahuec del Valle (ed.). Historia y Memorias de la Comunidad Étnica Chuj (in Spanish). II (Versión escolar ed.). Guatemala: Universidad Rafael Landívar/ UNICEF/FODIGUA. OCLC 741355513. SEGEPLAN (2010). "Plan de Desarrollo San Agustín Acasaguastlán El Progreso 2011–2025" (in Spanish). Guatemala City, Guatemala: SEGEPLAN. Archived from the original ( PDF) on 2014-01-04. Retrieved 2012-09-26.